Katie was born and raised in Waipahu, Hawai‘i. Katie attended Punahou School from 6th grade until graduating in 2014. She now attends Worcester Polytechnic Institute in Massachusetts where she is currently pursuing her bachelor’s degree in Mechanical Engineering and a minor in Electrical and Computer Engineering. She is currently playing for the varsity softball team at WPI. In her free time she enjoys volunteering at the local animal shelter. Katie has always had a love for math and science, which pushed her to look into a future in the STEM field. 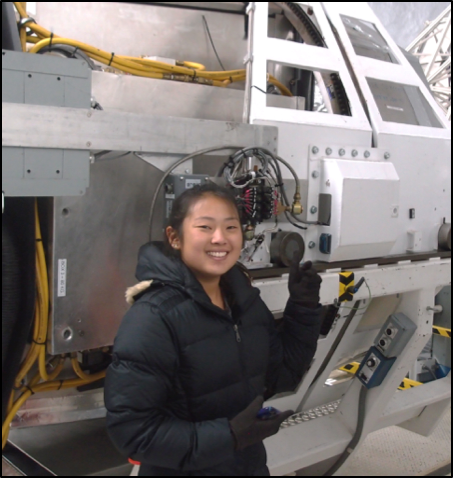 She hopes to pursue a career in Mechanical Engineering design and return home to work in Hawai‘i. There are five different Cassegrain instruments that are used in the Keck observatories. Each instrument performs a different optical function so visiting scientists can choose the instrument that best suits their research needs. When these instruments are switched out they are moved on and off the Keck telescopes via a rail system. There is a mismatch in the rails that puts a shock load of up to 10 g’s of acceleration on the instruments. The purpose of this project is to design solutions for three problem areas of the current system that have been determined as most damaging to the instruments: height differences of the floor rails, misalignments between the handler and Cassegrain rails, and binding of the tertiary mirror in the tower rails. These solutions aim to reduce or eliminate the potentially damaging shocks. In order to characterize the extent of this problem, various measurements of the rail system were taken, including rail misalignment measurements and shock loads during instrument moves. New designs for the rail system were created in SolidWorks to address each problem. Two to three different solutions were conceptualized with a recommendation for which solution would be the most effective and plausible to implement. The measurements and recommendations were compiled into a technical report, and will be reviewed and evaluated by Keck engineers to determine whether the solutions will be implemented to address the problem.